A beautiful and delicious surprise box for Palm Sunday (Tsvetnitsa) – a bouquet of fragrant roses and pastries, all in one. 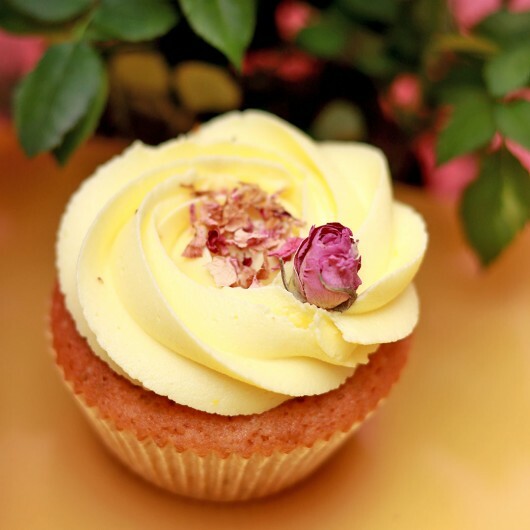 The flowers in the bouquet, the remarkable Rose Cupcakes, have a tender taste that combines Belgian white chocolate Callebaut, pistachio and bio rose water. The fluffy cheese cream frosting brings the fine delight to pure perfection. And all that, sprinkled with pink-purple rose buds and petals. Order and pay online, and we will deliver your box anywhere in Sofia. The set includes: 6 Rose Cupcakes for Palm Sunday. Weight: 540 g +/- 5% for 6 cupcakes. 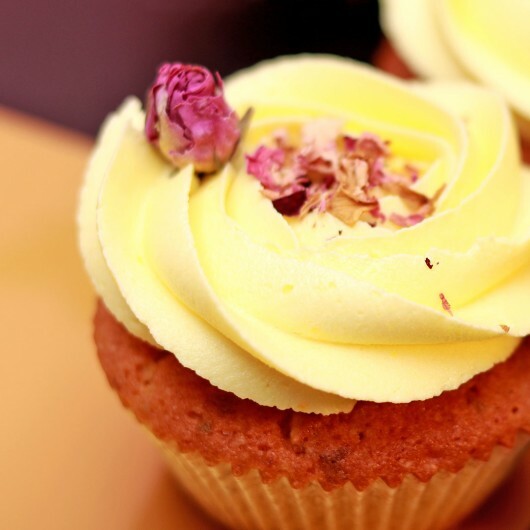 Ingredients: cow’s butter, white powdered sugar, cream cheese, white wheat flour, eggs, white crystal sugar, pistachio, white chocolate, bio rose water, organic dried rose buds, baking powder, organic dried rose petals, salt, food colourings (in the frosting). Nutrition Facts. Amount per 100 grams: Energy 1962.0 kJ/468.9 kcal. Fats: 29.0 g, of which Saturates 16.6 g. Carbohydrates 46.7 g, of which Sugars 37.7 g. Protein: 5.3 g. Salt: 0.3 g.
6 cardboard boxes with solid fittings for 1 standart-sized cupcake or a muffin. Its special construction is perfectly suited for transportation of our product. The minimal number that you can order is 6 boxes. The whole sum of boxes ordered has to be devidable by 6. 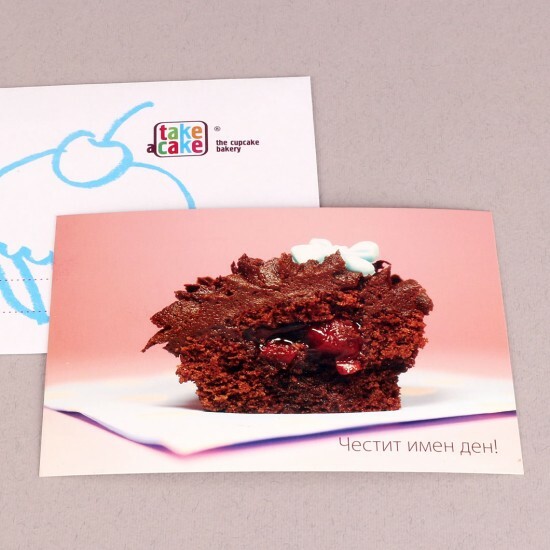 A cardboard box with solid fittings that holds up to 6 standart-sized cupcakes or muffins. Its special construction is perfectly suited for transportation of our products. A luxury black leather textured cardboard box with solid fittings that holds up to 6 standard-sized cupcakes or muffins. Its special construction is perfectly suited for transportation of our products. Say Happy Birthday! with this card. You can add a message during checkout in the field Message in a greeting card. The card will be delivered in an envelope with the names of the sender and the recipient on it. Say I love you! with this card. You can add a message during checkout in the field Message in a greeting card. The card will be delivered in an envelope with the names of the sender and the recipient on it. Greeting card for every occasion. You can add a message during checkout in the field Message in a greeting card. The card will be delivered in an envelope with the names of the sender and the recipient on it. 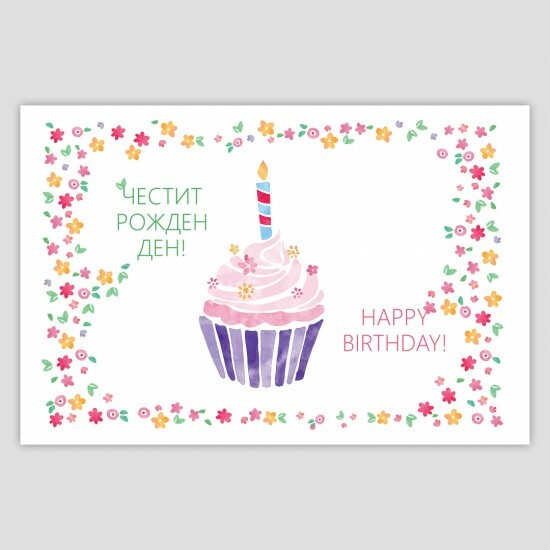 Say Happy Name Day! with this card. You can add a message during checkout in the field Message in a greeting card. The card will be delivered in an envelope with the names of the sender and the recipient on it.dwritten with a wish. Type here the location name, for which the certificate is intended. It is required by nursery schools, kindergartens, schools, party centres, hotels, event centres, restaurants, bars, and others. You’ll receive the certificate with your order for no additional cost.